Besides the stuffing, one of the best things about our Thanksgiving meal is the leftovers! My family LOVES sandwiches made with a little mayo, leftover turkey, and a sprinkling of salt. Deliciously boring, right?! 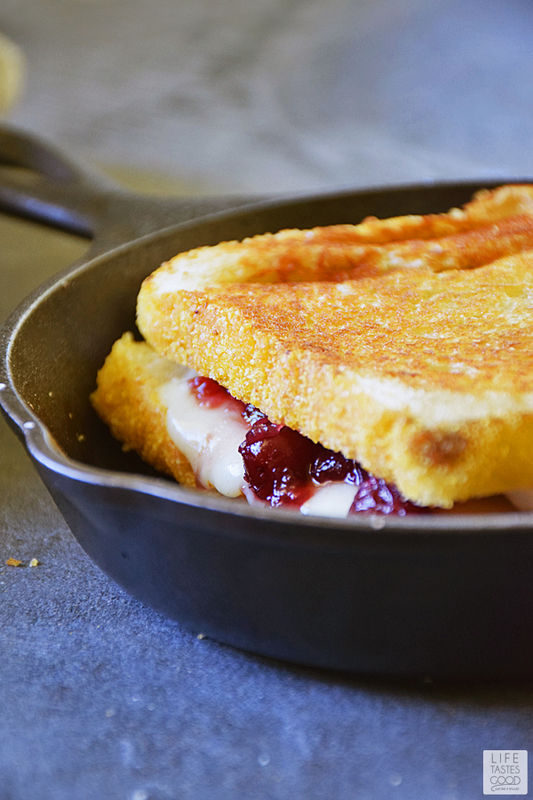 I decided it was time to liven things up around here, so I made this Turkey Grilled Cheese with Cranberry and Brie. Our taste buds are giving thanks! The #SundaySupper Tastemakers are already dreaming of Thanksgiving leftovers! Today we are sharing our favorites so you'll be armed with a treasure trove of the best Thanksgiving leftover recipes after you enjoy the big meal. Because it uses leftover turkey and cranberry sauce, this sandwich is very easy to make and only takes minutes to go from skillet to taste buds. The combination of savory turkey with the sweet, tangy cranberry sauce, and creamilicious brie is very satisfying and delicious. You may never go back to plain ol' turkey sandwiches ever again! To make this sandwich, begin by gathering your ingredients. Heat a skillet over medium heat. While the skillet is heating up, slice the cheese, butter the bread, and have the turkey and cranberry sauce handy, because this will move quickly. 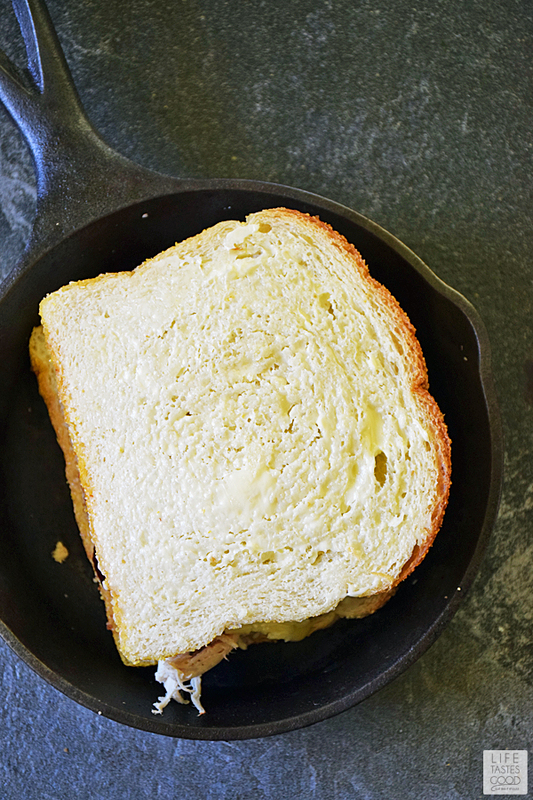 Once the skillet is sufficiently heated, place one slice of bread buttered side down in the hot skillet. Listen to the beautiful sound of that sizzle, but not for too long, or else your bread will burn and that will be sad. 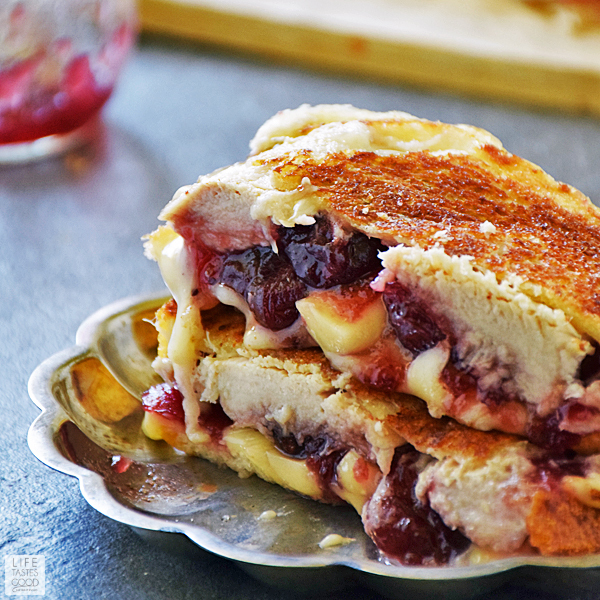 Top the bread slice with a couple slices of turkey and salt it as needed, then spoon on a tablespoon or two of cranberry sauce, and top that with the brie cheese. I use about 2-3 ounces of cheese per sandwich, but this is not rocket science folks, so use what looks good to you. Top the cheese with the other slice of bread, buttered side up, and then lift up the sandwich just a bit to see how the toasting is coming along. Once you've built the sandwich, the bottom slice of bread should be nicely toasted, but I like to check before flipping it over just to be sure. Because it uses leftover turkey and cranberry sauce, this sandwich is very easy to make and only takes minutes to go from skillet to taste buds. Heat a skillet over medium heat. 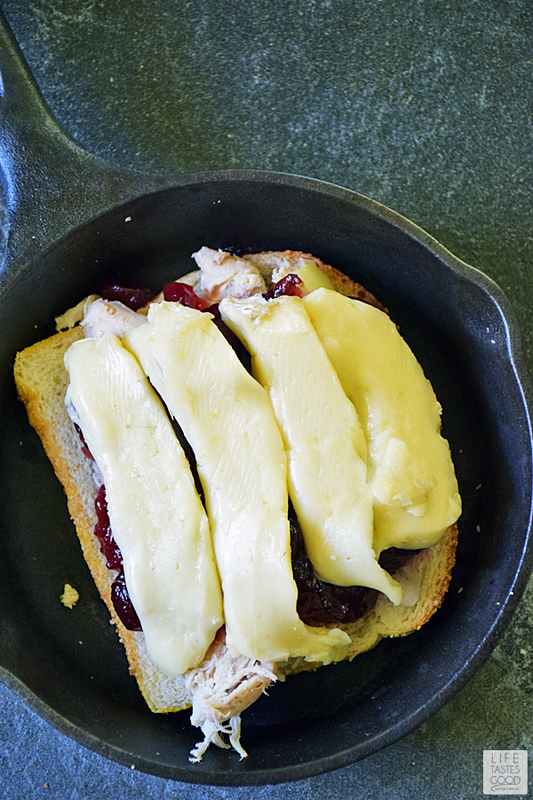 While the skillet is heating up, slice the cheese, butter the bread evenly all over, and have the turkey and cranberry sauce handy, because this will move quickly. 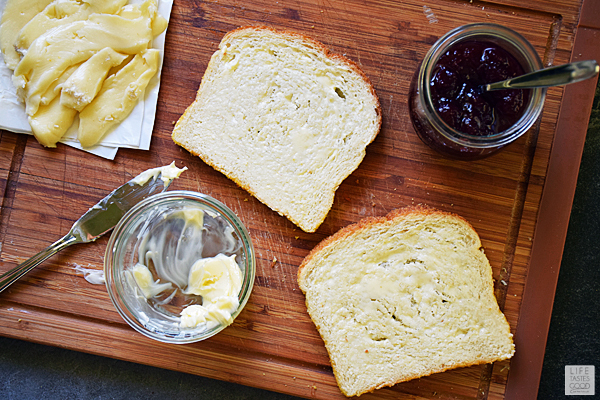 When the bottom slice of bread is toasted to your liking, carefully flip it over to toast the top side of bread. It only takes about a minute to get nicely toasted. This will also warm the inside ingredients of the sandwich and melt the cheese nicely. You'll be able to see the cheese melting while you are toasting the bread. 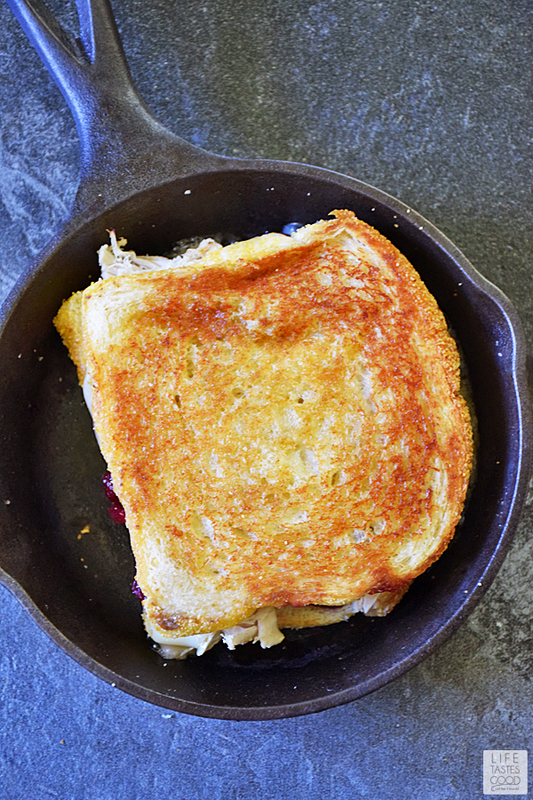 When the sandwich is toasted to your liking on both sides and the cheese is nice and melty, remove it from the skillet to a cutting board. 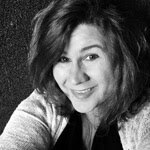 Cut in half and enjoy! This is such a fabulous over the top in the best way sandwich. I would skip dinner and head right for it! What a great post Thanksgiving lunch idea! Wow, this looks super tempting. 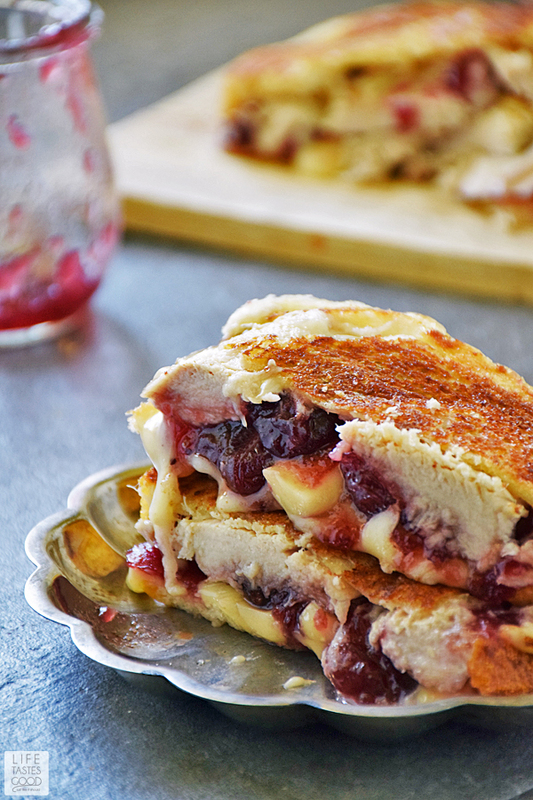 The combination of brie and cranberry cheese is simply divine! From these simple and affordable ingredients you get an excellent snack that absolutely everyone will like.